Start date: Saturday, February 9 2019. This is an opportunity for young children and their parents to be introduced to musical instruction on the violin using the Suzuki method. This class builds the concepts of rhythm, pitch and coordination necessary to play the violin. Parents attend the weekly class, and using the Suzuki Violin Book 1 and CD, assist their children with daily practice. Notes: Parents are required to stay in the class with the students. 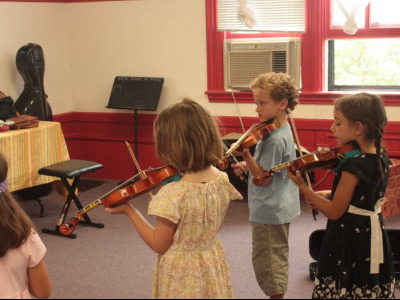 Later levels of Suzuki violin instruction include both private lessons and group classes.